You’ve probably tried your hand at pocket scrapbooking before, but have you ever tried using pocket cards on your traditional scrapbook layouts? 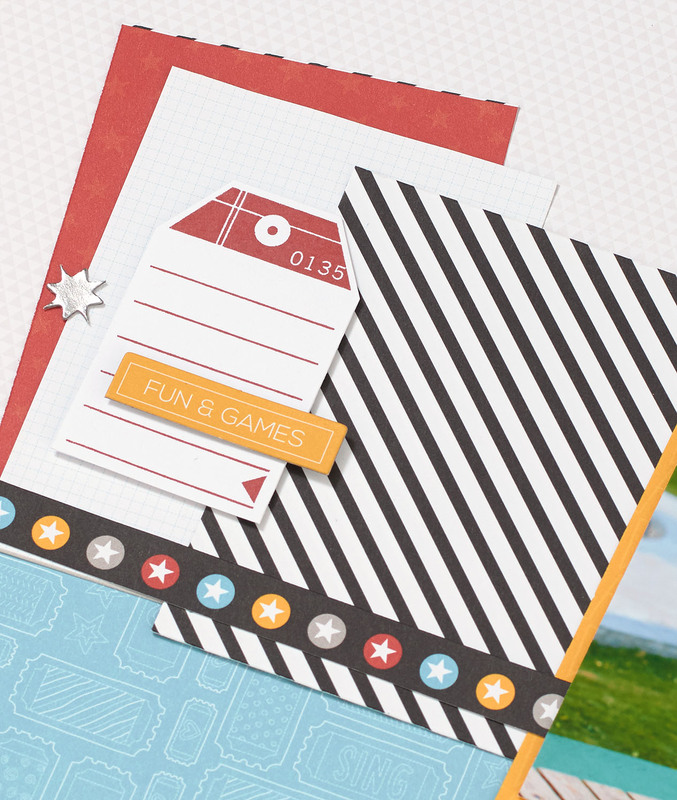 Just like with pocket scrapbooking, these cards can help you put together a beautiful layout in a flash. Each of our paper packets comes with two 12″ x 12″ sheets of pocket cards that you can cut apart and use in a variety of ways. 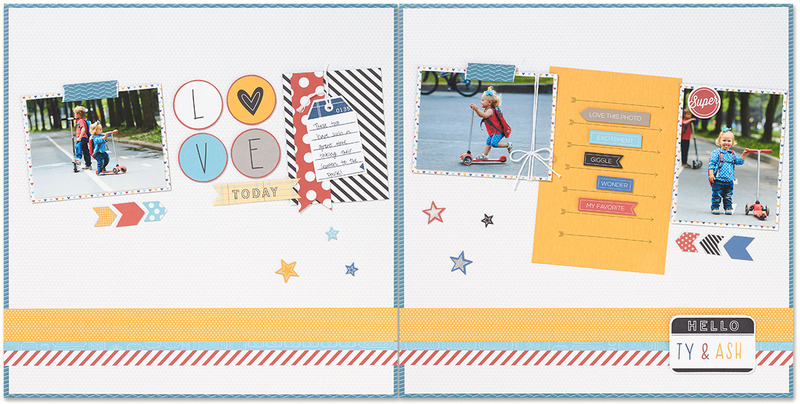 We used a bunch of these cards from the Magical paper packet to make this adorable layout. Can you spot them all? First up, there’s the “Love This” card. Our cut-apart pocket cards always include a title card that you can use as your main sentiment. Next, we have the journaling card. Here, we used one of the decorative cards for our journaling by adding a few lines with a ruler and pen, but you’ll also find cards with pre-printed lines in our cut-apart cards, too. Either way, pocket cards make adding journaling to your pages a piece of cake! Then we have the Honey photo mat on the right page—it’s a pocket card, too! Because our pocket cards come in both 4″ x 6″ and 3″ x 4″ sizes, they make great photo mats. This layout shows what happens when you get creative with your pocket cards! Rather than cutting into a 12″ x 12″ sheet of paper to create paper accents, you can use pocket cards, which offer additional patterns not found in your larger papers. Take a look at the “Love today” title, for example. The circles come from the “Love This” card, and the word “today” was stamped on a trimmed down piece of another pocket card. Whether you’re looking to put together a layout quickly or you’re just looking for some fresh ideas, pocket cards have your back. Try them out for yourself—they will change the way you scrapbook! p.s. Remember our Magical Convention contest? Now is the perfect time to try using the Magical pocket cards to create a layout with your Convention photos! Share your layout on social media using the hashtag #magicalconvention for a chance to win one of our brand new My Legacy™ scrapbooking albums! Be sure to post your picture by July 25, because on July 28, we’ll randomly select five winners and announce them on the blog. How timely is this? I was trying to decide on a card for my granddaughter and this came up. I think I will make it for her. Thanks. Thank you so much for these suggestions. Not being a pocket scrapper, I can now out these sheets to good use and not just take up paper space. Thank you. Love this idea. You have such a great creative team working together to give us the best ideas… Especially for those of us who are not so gifted. Thank you! I’m a new member to your site and thank you for accepting me! I have been Scrapbooking for about 14 years. However I am new to rubber stamping and trying to get “the hang of it” I have seen different ways of doing it and would love to know what you recommend. I have seen people Cole their stamps with markers, push the stamp down on an ink pad. What do you feel is best? Also how do you get all the different colors onto one stamp? This is a whole new, exciting territory for me and I’m open to all the suggestions and advice I can get!! Welcome Suzan, we’re so glad you’ve joined us! There are lots of ways to use your stamps and we recommend trying them all! Our main preference is using an ink pad to get your main stamp color, and there are lots of ways you can get creative with that. If you search the term “stamping” on this blog (using the search bar on the right) or our YouTube channel you’ll find lots of great stamping techniques to try out. Happy stamping! Hi, Suzan! Welcome! Sorry for the late response.